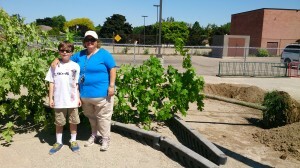 Grand River Conservation Foundation has granted Forest Hill’s TreeGeneration $250 toward our Five Trees Around the Climbers. 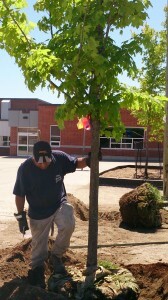 The trees, border and mulch have been completed and already the shade of these five trees makes a great difference on our school yard. Thank you to Hunter family, Heuval family, VonWeyhe family, Griffin family, Bristow family, Peter, Melissa, Rebecca, Erin, Kristy, and Kira for being part of this effort to raise money for our new Outdoor Learning Grounds! I can’t do any of these things without the wonderful volunteers! Forest Hill’s TreeGeneration committee members started the plans for this phase before we began to help with the learning grounds project. Our main goal, as always is to create a “cool” and shady place to play and learn while at school. We have six ash trees that, while they are not showing signs of emerald ash borer, they will in all likelihood die within a few years. So we are adding five more trees around the climber to add shade in the hopes that the new trees will grow quite a bit before the other trees are gone. 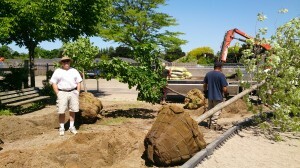 Three more trees on the bench side of the climber and two more trees on the side closer to the asphalt. 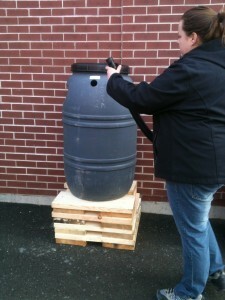 April 26 is the Blitz day, where everyone who pre-orders their rain barrels and accessories come to Forest Hill Public School to pick up their orders. A very cold start to spring but flowers were on our minds while deciding what to order from the Vesey’s Bulb fundraiser. Thank you to all who found friends and family to order and thank you to all of those who ordered bulbs for their own gardens. May 24 is coming….in two months! 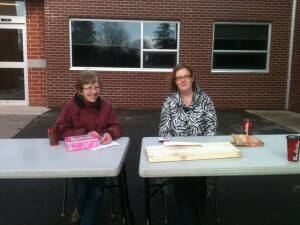 A little over $1700 was raised towards the Outdoor Learning Grounds Project! 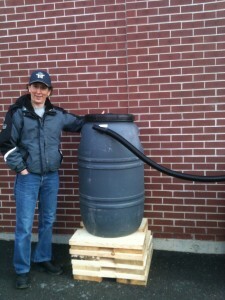 Our committee has join forces with WRDSB and Forest Hill staff to create an outdoor natural learning grounds. Designed with early learning in mind, its’s an integrated outdoor play and learning environment where students learn by doing, experimenting and observing. 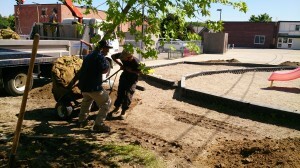 Teachers and students will be able to enjoy diverse and stimulating outdoor play opportunities. The space will include a combination of trees and shaded seating, a pathway, a no mow area, a play deck, a sand area, a bridge, a natural climbing components utilizing a berm and logs, and play posts. While the focus is on Kindergarten students, all students in the school will benefit from the space. 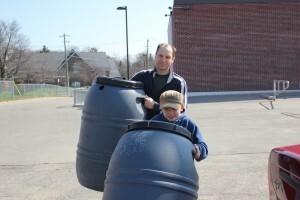 Being part of a pilot program our teachers will help teachers from other schools in the Board, learn how outdoor play will expand the learning experience. There will be positive impacts on health as children will be more engaged with their space, increasing their level of physical activity. Shade trees will also benefit students whether they are active or passive in the space. Unfortunately, I can’t post the original drawing or the updated computerized version until I learn how to copy a PDF file.